Your blog yesterday was much more detailed about 594 and not almost fluff compared to today’s front page effort “Inslee pressing to secure Senate.” Yesterday you provided lots of details about controversies around 594–half a page worth. Today I must ask, does it really make sense that any governor would back a senatorial candidate based on one issue (carbon tax in this case)? Think of all the issues facing the last legislative session–school funding, mental health, ferries, tax breaks for corporations, roads, and health care (Medicaid too) to name a few. Does it make sense for a governor to strongly oppose one powerful senator for only one reason? At least with the 594 blog I could evaluate your opinions. Today, I just don’t feel you are sharing the major facts? Am I wrong? With regard to 594 get the legal background on relevant gun control judicial decisions from retired Judge Russell Hartman. I just heard him speak over the weekend. I think he is a grad of Harvard and the UW. 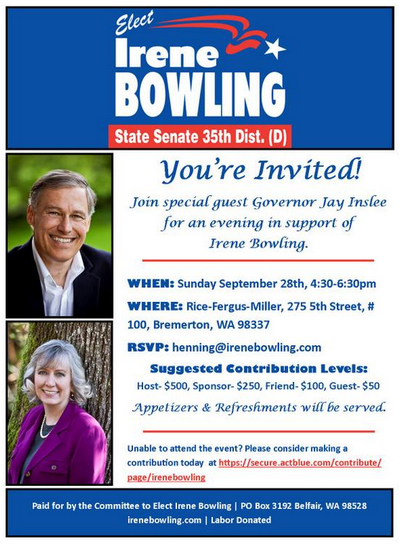 I have never met him, you or Inslee. I rely on the Kitsap Sun. You are correct that there are a number of issues for which Inslee would prefer to have a real Democratic majority in both houses. Thanks.